Gourmet Recipe Manager - A powerhouse app to collect, search and organize recipes ~ Android Forever! I've been looking for an application like this for a long, long time! 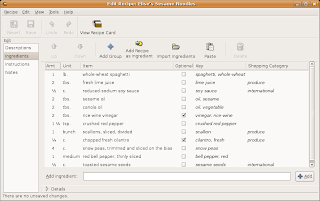 "Gourmet Recipe Manager is a simple but powerful recipe-managing application. 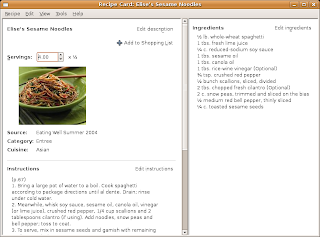 Gourmet is intended for the GNOME desktop environment, but works on any platform that gtk supports, including windows. Gourmet allows you to collect, search and organize your recipes, and to automatically generate shopping lists from your collection. The latest version also allows you to calculate nutritional information for your recipes using the USDA food database (or entering custom information by hand)." Windows users: Look through the stable releases for the most recent .exe package.